Chocolate – contains theobromine which is extremely toxic to dogs. The darker the chocolate, the more theobromine so cooking chocolate or luxury high cocoa percentage brands are the worst. Be safe and NEVER give chocolate to your dog. Onions, shallots, garlic – also potentially fatal if eaten in large quantities especially if raw. Grapes, raisins, sultanas – a Christmas favourite for us but these foods especially in dried form can be very toxic to your dog’s kidneys so avoid them completely. Cooked bones can splinter so although it is very tempting to give your pet the leftovers, make sure any bones are too large to be swallowed. Many other foods e.g. avocado, apricot kernels, peach stones can cause tummy problems or obstructions. If you want to give your pet a seasonal treat, stick with a small amount of plain roasted turkey without any skin or fat! Many of the plants that we commonly have in the home at Christmas are very toxic to pets – holly berries, mistletoe and yew are the most frequent culprits. Ensure that if you have any of these plants they are well out of your pet’s reach. Lilies are particularly poisonous to cats – even a small amount of ingested pollen can cause fatal kidney failure. If you have a cat, please don’t keep lilies in the house. Decorations are very enticing to pets, particularly cats. 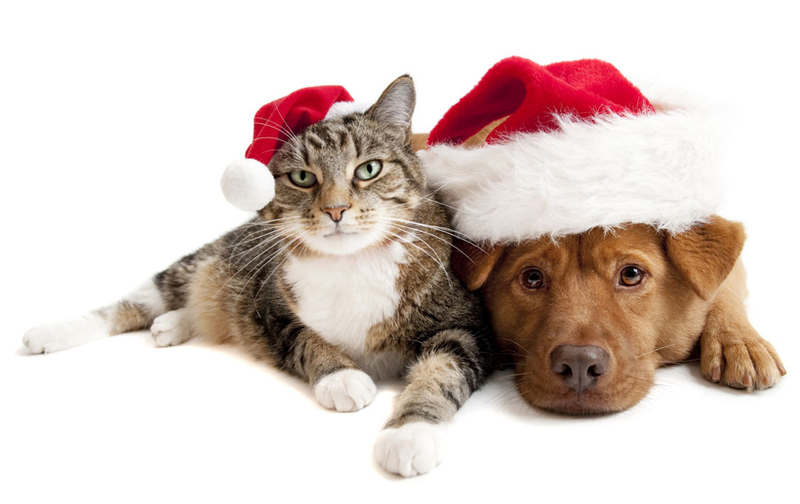 Make sure that your pet cannot reach any of the decorations on the tree and avoid tinsel altogether as it can cause serious intestinal obstruction if eaten. Keep wires supplying lights and other decorations well protected – they are very tempting for your pet to chew and an electric shock can easily be fatal. Ensure that the tree is completely stable and cannot be pulled down by your pet. Batteries can be fatal if ingested. If you have children, check that no batteries from the inevitable Christmas electronic games are left lying around! Most Christmas dangers are easy to avoid so play safe and have fun! Please call us on 020 7221 3093 if you have any specific questions. Your pet’s teeth are as important as yours!